Last year we looked at the most popular day to complete on a home purchase throughout the UK and found that around half of sales complete on a Friday. So we thought, with Spring now upon us and the sun beginning to shine, we would take a moment to see how this compares with tenants starting a new lease. Unsurprisingly, the end of the week and weekend is the most popular time to move into a new home in the rented sector too. However, with finance transfers not required in the same way as when buying a property, tenancy starts are spread over Fridays and Saturdays. The most popular day of the week to begin a tenancy is Friday, accounting for 24% of tenancy starts in the UK over the last three years. 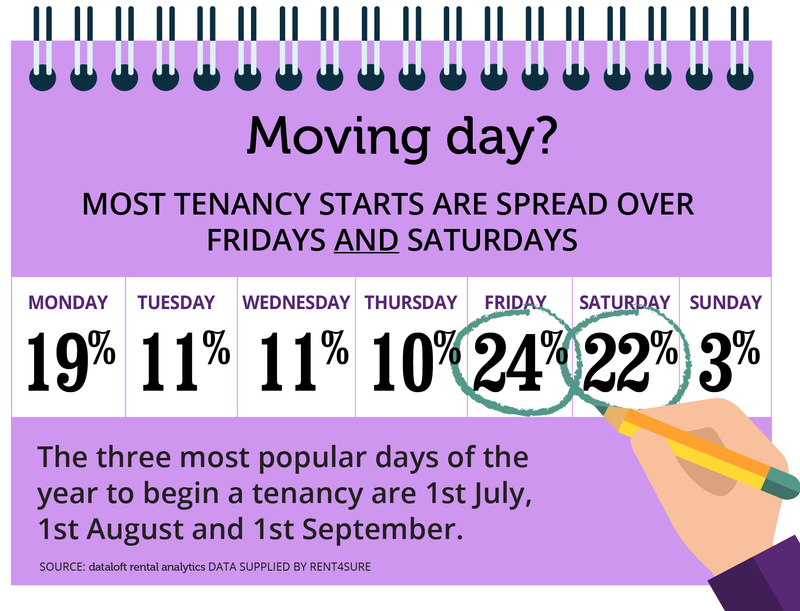 The next most popular day is Saturday with 22% of tenancy starts. Our analysis also reveals that the three most popular days of the year to begin a tenancy are 1st July, 1st August and 1st September. This year, the 1st September looks set to be the busiest day of the year, falling on a Saturday.